How wrong mere logic can be when it becomes detached from reality. –Edward Upward, 1988. With fakes everywhere—including fake news sites, fake news stories, faked incidents and even fake journalists—teaching journalism or any other kind of writing also becomes teaching discernment and discretion. It becomes teaching how to be honest in writing and research, and why. Yet, in a milieu of dishonesty, it’s increasingly hard to convince students that they need to be forthright in their explorations and presentations. It’s hard to convince them not to retreat behind assumed belief, the ideas they carry into the classroom, as personal “truth” (whatever that is). Everyone is lying, after all; why should their teachers be any different? Everyone has an agenda, people believe—including students; we’re all attempting to convince, not inform—and we’ll twist the “truth” to meet our goals. Well, yes. But it’s not so simple, not so easy to justify blocking things out. Certainly, misinformation abounds. But both journalists and students are tasked with sifting truth from chaff. If they don’t, they fail. Journalism fails. Education fails. The received value of names imposed for signification of things was changed into arbitrary. For inconsiderate boldness was counted true-hearted manliness; provident deliberation, a handsome fear; modesty, the cloak of cowardice; to be wise in everything, to be lazy in everything. –Thomas Hobbes, 1629. The meaning of words had no longer the same relation to things, but was changed by them as they thought proper. Reckless daring was held to be loyal courage; prudent delay was the excuse of a coward; moderation was the disguise of unmanly weakness; to know everything was to do nothing. –Benjamin Jowett, 1900. They reversed the usual evaluative force of words to suit their own assessment of actions. Thus reckless daring was considered bravery for the cause; far-sighted caution was simply a plausible face of cowardice; restrain was a cover for lack of courage; an intelligent view of the general whole was inertia in all specifics. –Martin Hammond, 2009. All three have similarity enough to give a good idea (to someone like me, who doesn’t read Greek) of the intent of the original passage. At the same time, they show how the English language changes—and how small differences in meaning can lead to large differences in assumption. Take just the last phrase in each: “to be wise in everything, to be lazy in everything,” “to know everything was to do nothing,” and “an intelligent view of the general whole was inertia in all specifics.” They are the same—but different. Sure, the differences have to do with time of composition, changing styles of translation and individual artistry, but the meanings are different, too—even while similar. Not only that, but each could be used in different senses and even opposing purposes in today’s American political environment. At the same time, each and the rest of the list (Thucydides’ point) is both meaningless and an abuse of language (or meaning). Orwellian before Orwell. Simplistic though this may be, it possibly can help me cut through the wall of belief that so effectively stops discussion in the classroom as in the nation. How does one respond when, say, Donald Trump, for example, tweets that he “won the popular vote if you deduct the millions of people who voted illegally.” News media added “falsely” or “with no evidence” to their headlines, but not even that solves the problem posed by the very fact of the tweet: Trump is taken at his word by millions. By going back to Odgen and Richards, I am deliberately sidestepping, avoiding (among many others) Peirce, Wittgenstein, Ayer, and even Rorty. Mine is not a philosophical investigation but a quest find a way to break down a barrier we have raised in public and educational discourse. I’m looking for simple and utilitarian answers, not contingencies nor verifications, for something that can be used to break the logjam in politics and in the composition classroom created by unswerving belief and brazen lies. I am no philosopher or linguist, anyhow. I am merely a writing teacher and a student of American culture with a particular concern for contemporary political discourse. 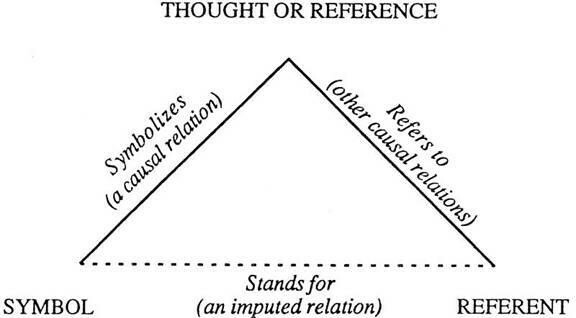 In the context of the triangle, Trump’s tweet counts as an idea expressed in words but without referent. Without referent, it should collapse into a line, two dimensional and without relevance except for the nature of its source. That is, if it weren’t Trump’s tweet, it would be dismissed completely. This, not surprisingly, is the same problem that composition teachers often have with their students. That something is a student’s idea makes it important, not the referent (or the world), or the symbol (or the words). Like Trump, they don’t need to explain, students often think, merely to aver. To them, the personal source makes it significant and viable on the face of it—that is, the nature of the source changes the nature of the statement. Yet that source is not even part of the triangle (this becomes significant to understanding the New Critics, followers of Richards, who would dismiss intentionality—more about that in a second). That is, Trump’s intent (or his personality) has nothing to do with the validity of his statement—not, at least, in terms of the triangle. The quandary for news media, all of which know that the statement in Trump’s tweet is nonsense, was how to handle something that makes no sense in terms of this traditional triangle. As a result, the tweet was presented with various degrees of hamfistedness or deftness, some platforms, on recognition of the problem, quickly amending their headlines and stories to more clearly reflect the speciousness of Trump’s assertion. In a classroom, there would be a similar range of responses with, however, even more of an attempt to ‘respect’ the speaker—and therein, once again, lies the problem: We add that speaker into a triangle that has no place for her or him, not on a flat diagram. You can’t make that triangle into a pyramid without creating a third dimension, though many of us try. The anti-intentionalists distinguish between verbal behavior meant to make a point and verbal behavior meant to show someone making that point, placing verbal art in the second category and claiming it is thereby removed from intentionalism and stimulus/response continuity. There is certainly a difference between someone yelling “fire” from the audience of a theater and an actor on stage yelling out the same word. This difference can cause problems in journalism and in the classroom. Is an event (verbal or otherwise) truth or play? And how does one differentiate? Jay Rosen, who teaches journalism at NYU explains the impact these questions on journalism by pointing out the difference between “evidence-based” and “accusation-driven” reporting. His evidence-based reporting deals with truth of the yell in terms of the actuality of the theater and not the play on the stage. Accusation-driven reporting sidesteps the difference between the two, sometimes giving both equal weight under a cloak of ‘objectivity.’ The truth of something doesn’t matter, only that claims are made does. Rosen writes, “If you are evidence-based you lead with the lack of evidence for explosive or insidious charges. That becomes the news. If you are accusation-driven, the news is that certain people are making charges.” He goes on, “Instead of defining public service as the battle against evidence-free claims, they will settle for presenting the charge, presenting the defense, and leaving it there, justifying this timid and outworn practice with a ‘both sides’ logic that has nothing to do with truthtelling.” The former demands examination of intent, making that (and not the accusation) the story, erasing the possibility of falling back on that ‘both sides’ equivocation. The latter simply reports the charge. The problem is, Trump’s tweet cannot be examined as a stand-alone text unless one is willing to posit that it creates its own reality. If it does, then a story about it and competing ‘realities’ is completely justified—and the triangle disappears. Truth disappears. Without evaluating the speaker (or writer) and his or her intention, we retreat into a world based on the assumptions behind the words–and those may have nothing to do with the triangle that most reporters try to hug. This may be fine in the study of literature, which was the New Critics’ bailiwick anyhow, but it does not work in journalism, where the reason behind expression of the words, their purpose, is as important as the words themselves. 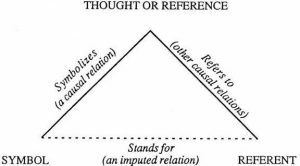 Just so, when we write, we need to consider two factors, the triangle itself and the reasoning behind our own attempt at expression. Can we remove our own beliefs from our explorations, examining our words and the world, our ideas and the world, and our words and their relationship to our ideas? Can we do this without retreating to ‘It’s what I believe, so there’? Can we separate belief, which relies on assumption, from ideas, which rely on world and words? It’s easiest, when writing, to imagine that one is simply reporting the words and actions of others, but that is never sufficient. Not only does that make the reporter eminently manipulable (just look at how easily Trump out-played the antagonistic news media), but it leaves the news–or the paper–incomplete. If one does not step outside of the simple triangle and examine motivation, one will never have a story that can stand on its own. It’s flat and will fall down. Intent provides a third leg, expanding the story to a pyramid, something that can stand for centuries.